Shoe Benches And Racks Shoe Benches For Storage. Modern design 3 drawers bench with soft seat cushion, good choice for hallway and living room. Solid Wood Shoe Bench. Easy to assemble. Strong construction.Size:35-3/8 In. (L) x 13 In. (W) x 18 In.(H). If you like the Stackable Shoe Rack concept but prefer a more self contained unit this Model is the answer. This Mobile Shoe Caddy is actually 3 stackable shoe racks on casters for added versatility. It also features a handy, useable top. 4219 Features: Constructed from durable melamine laminated particle board Built-in top for storage Compact and portable Casters add mobility Made in the USA Assembly required Finish: Available in White, Black and Oak Finishes Dimensions: 24 In. (W) x 12 In. (D) x 31 In. (H) Item Weight: Approximately 30 lbs. 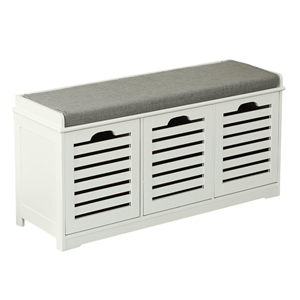 This Versatile Item Can Be Used As A Storage Bench, Both Doors Open Up To Reveal A Shelf For Storage, Can Be Used In Your Entrance Hall As Shoe Storage Or At The Foot Of Your Bed. Finished In Our Soho Finish. Size: 54 In. (L) x 19 In. (W) x 21-3/4 In.(H). Simple, versatile space-saving organizer with adjustable panels lets you customize your design and configure it to exactly what you need-for shoes and boots, clothes, purses/bags, books, CDs/DVDs, more. Doubles your storage capacity, adjusts to fit a variety of spaces in the home. Sliding shelves provide easy access. Easy assembly. Set includes 6 side panels, 4 back panels, and 8 shelves. Durable polypropylene. 13 In x 9 In. side panels, 9 In. x 9 In. back panels, 12-3/4 In. x 9 In. side panels.